The black-naped tern (Sterna sumatrana) belongs to the family of gulls and terns, the Laridae. The black-naped tern is distributed in the islands of the western Indian Ocean, coasts and islands of southeast Asia, western Pacific islands, China and Australia. These tern species have a distinctive black eye-mask joining across upper nape. These terns are polytypic species. The black-naped tern (Sterna sumatrana) is a medium-sized tern, measuring 31 to 35 cm in length and weighing 95 to 100 grams. In breeding plumage, black-naped tern species have white head with a distinctive blackish eye-mask joining across upper nape. The mantle and upperwing are very pale gray. The outer primary is dark. The rest of the upperparts are silvery white. The underparts are gleaming white. In breeders, sometimes the underparts have pink wash. The deeply forked tail has long white tail streamers. The non-breeding adult has a few dark streaks on the hind crown. The bill is long, sharp and blackish in color. The juveniles have yellow bill. The irises are blackish. The legs and feet are blackish. The call of these black-naped tern species is a sharp, harsh, "chit", "kik" or "chit-er" sound. The black-naped tern subspecies S. s. mathewsi are distributed in the islands of the western Indian Ocean and eastern African coast. They breed in Seychelles (Aldabra, Farquhar, Alphonse, Amirante), Chagos Archipelago and Maldive Islands. The black-naped tern nominate subspecies S. s. sumatrana is distributed in coasts and islands of southeast Asia, western Pacific islands, coastal southeast China, Taiwan, southern Japanese islands and northeast coastal Australia. In India, breeding black-naped terns are distributed in the Andaman and Nicobar Islands. Non-breeding, wintering birds occur in the Andaman Sea and Bay of Bengal around the Andaman and Nicobar Islands. The Important Bird and Biodiversity Areas (IBA) of these black-naped tern in Seychelles are, African Banks, Farquhar - South Island and islets, Cosmoledo and Aldabra Special Reserve. The IBA in Malaysia is Talang-Satang National Park. 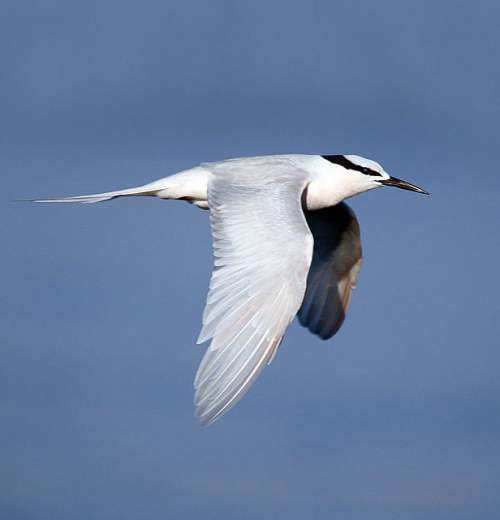 The IBA of the black-naped tern species in China are, Beiji Islands, Zhongjieshan Islands, Yushan Islands, Wuchishan Dao Nature Reserve, Taizhou Islands, Nanji Islands Nature Reserve, Jiushan Islands Nature Reserve and Dongtou Islands. The IBA of the black-naped tern species in Japan are Yaeyama islands, Aragusukujima and Iriomotejima Islands, Okinawa coastal islets and Okinawa coastal islets - Marine. The IBA in Taiwan are Matsu Islands Tern Refuge and Northeastern Sea Islets. These black-naped tern species do not normally occur in forests. They normally occur in altitudes from 0 to 100 meters. The natural ecosystems and habitats of these species include sandy, rocky shoreline, sand bars, sand spits, sea cliffs, rocky offshore islands, coral reefs, shallow seas with macroalgal growth, subtidal mudflats, lagoons, marine lakes and open seas. The diet of this black-naped tern consists mainly of fish. Small surface-schooling fish and young ones of anchovies, flying fish, Old World silversides, herrings, young shads and sardines are their primary food. These black-naped terns surface-dive to pick small fish in shallow waters around small offshore islands among reeds, sand spits and lagoons. The also forage by shallow plunge-diving. The breeding season of these black-naped terns is from May in most of the breeding range of subspecies S. s. sumatrana. The breeding season of the subspecies S. s. mathewsi is during September and November. These species are monogamous and breed in small colonies. 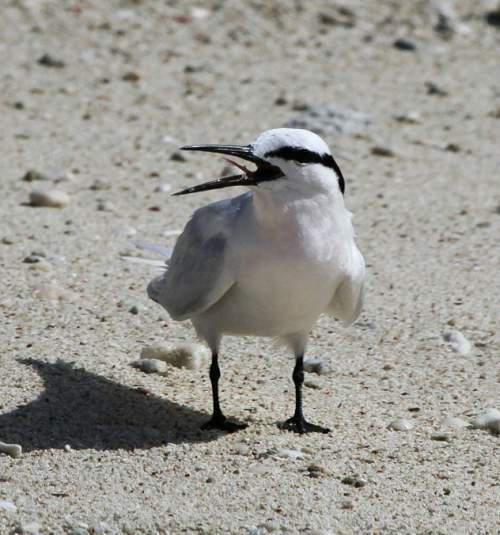 The nesting sites of the black-naped tern are located above the high tide line on the shores of islands and coral banks. The nest is a shallow depression in the sand or gravel. The typical clutch contains two eggs. Replacement clutch may be laid following loss of the first clutch. These black-naped tern species are partially migratory birds. The southern breeding populations after departing the breeding grounds, spend much of the non-breeding period in the surrounding seas. The northern breeding populations in China and Japan move southward for wintering. The global population size of the black-naped tern (Sterna sumatrana) has not been quantified. The overall population trend of the species is not known. In most of its range, this tern species is reported to be uncommon to common. The generation length is 6.2 years. Its distribution size is about 61,800,000 sq.km. Breeding habitat alteration and destruction and human disturbances in nesting sites are the main threats that are endangering the survival of these species. The black-naped tern (Sterna sumatrana) does not approach the thresholds for being Vulnerable, either under the range size criterion, or under the population trend criterion or under the population size criterion. The CITES (Convention on International Trade in Endangered Species of Wild Fauna and Flora) status is ‘Not Evaluated’ for the black-naped tern (Sterna sumatrana). The black-naped tern (Sterna sumatrana) is closely related to the roseate tern (Sterna dougallii), white-fronted tern (Sterna striata), South American tern (Sterna hirundinacea), common tern (Sterna hirundo), Arctic tern (Sterna paradisaea) and the Antarctic tern (Sterna vittata). Current topic in Birds of India: Black-naped tern - Sterna sumatrana.